My idea of fast food is something I can whip up in less than an hour and it's healthy. Fast food doesn't have to be junk food. With a little planning you can make delicious, healthy foods your family will love . . . especially your kids and/or grandkids! Messy Janes and 40 Minute Burger Buns meet my fast food criteria. Make a double batch of Messy Janes and you'll have a great meal for now and a quick meal you can pull out of your freezer to use on those busy days when cooking is nearly impossible! This is the #1 fast food my Grands ask for every time they spend the weekend with us. "No one can make it better than Gramma!" We have renamed the classic sloppy joe, Messy Janes in honor of our 4 granddaughters: AJ, Hannah, Matty and Emmy! So, let's get started with the 40 Minute Burger Buns! 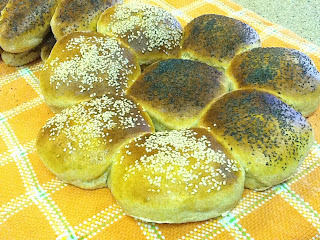 These buns can be made with a mixer, but I prefer using a bread machine because it saves time and cuts down on the mess. Before you begin set out all the ingredients called for in the recipe, also the kitchen tools you will need i.e. measuring cups, spoons, baking sheets etc. Also, fill your sink with hot, soapy water to wash up your baking tools as you go. If you don't have a dish drainer, purchase one, it will make cleanup so much easier. An important part of being a good cook is also being an effective home manager. That means we find efficient ways to keep our work environment tidy and clean, we plan healthy meals for our family and we save money by making food from scratch. These fluffy yet hardy buns are perfect for Messy Janes and burgers. To the bowl add: water, oil, sugar, egg, salt, and flour. Make a small hollow with your fingers in the middle of your flour, taking care not to break through to the wet ingredients below. Set bread machine on Dough Cycle. Let machine knead dough for 5 minutes. Turn off machine. Dough will be soft and sticky. Gently remove dough from bowl by pulling it from the sides and adding a sprinkling of flour as you work the dough onto a floured surface. Pat the dough to 1/2-inch thickness. (For tender buns handle dough gently and don't over flour as you work with dough). While waiting for buns to rest, separate an egg white and mix with 1 teaspoon of warm water and whisk together. 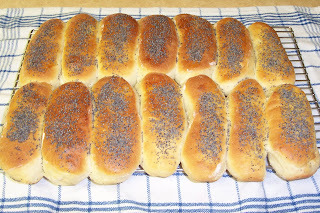 Brush gently on tops of buns; sprinkle with seeds. Bake 425degree F. oven on middle rack for 8 to 12 minutes. Drain grease (save your tin cans to pour grease into). Simmer for 10-15 minutes allowing flavors to mingle. Serve on split 40 Minute Burger Buns. 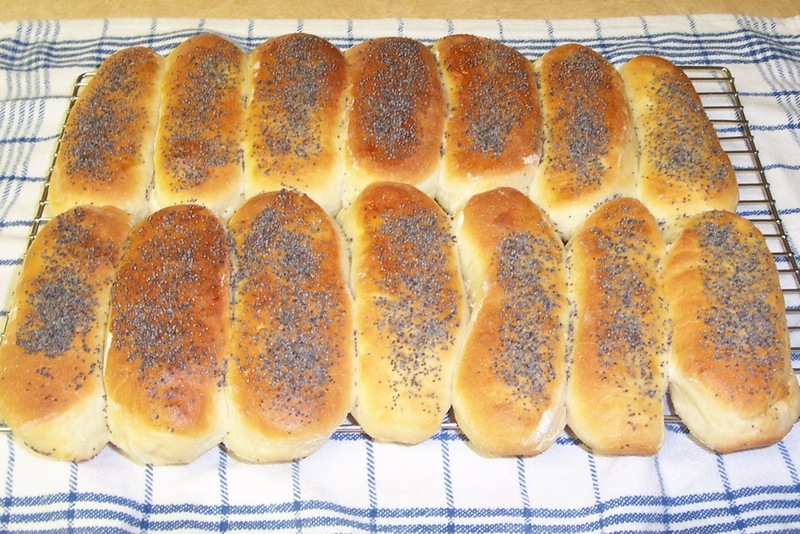 There is nothing quite like the smell of fresh bread baking in your very own oven! This is a great way to fill your house with wonderful smells, happy smiles, and these recipes are kid tested and Gramma approved . . . Over at Julie's. Homemade Goodness on a Homemade Bun!!! What to do with all those ripe Bananas. Valentine Cookies . . . Happy Monday!